ACTIVLAB Arthreo-Free is a dietary supplement that comprehensively supports the movement apparatus. It provides a high dose of three synergistic compounds - glucosamine, chondroitin and vitamin C.
The preparation is a valued element in the prevention of injuries, also those which are the consequence of doing sport. It is especially recommended for fans of the strength and endurance sports, who usually overload the osteoarticular system. It will also work well in overweight people and seniors who suffer from painful degenerative changes. Glucosamine is an organic chemical compound synthesized from glucose and glutamine. It is classified as amino sugar because in the structure, in position 2, it contains an amino group. In the body, it plays primarily the role of the precursor of chondroitin and glycoproteins. The composition of the presented supplement contains glucosamine sulfate, which is characterized by very good absorption and high bioavailability. Importantly, practically in all clinical trials on the properties of glucosamine, this form was used. In the body, glucosamine is present in the largest amounts in the cartilage. It acts as a kind of shock absorber; it can also stimulate the production of synovial fluid, which gives joints a certain 'lubricity' and protects against the excessive friction. The researchers have disproved the myth that glucosamine affects collagen synthesis, but they have shown that it can limit the expression of IL-1. This cytokine is a regulator of the inflammatory response that contributes to the degradation of collagen. Restraining the activity of IL-1 promotes a reduction in the intensity of inflammation, and as a result slows down the rate of collagen degradation. In addition, the reduction of inflammation usually correlates with alleviation of pain. Chondroitin is a chemical compound from the polysaccharide group, naturally produced in the human body. It is one of the key elements building articular cartilage, responsible, among others, for its durability. In addition, it promotes the production of proteoglycans contained in the connective tissue and prevents the loss of water from the gel substance produced by it, which performs protective functions and absorbs shocks. Specialists point out a close synergy of the action of chondroitin and glucosamine. In vitro studies have proven that in combination these compounds can stimulate endogenous collagen production. In addition, in the subjective feelings of users, this combination helps reduce the pain that accompanies the degradation of articular cartilage. Vitamin C is one of the most common and best-known vitamins. It is mainly associated with the strengthening of immunity, but in the body it has much more important functions. It plays a key role in the biosynthesis and cross-linking of collagen. It activates prolyl and lysyl hydroxylase - enzymes that allow for proper crossing of collagen fibers. In addition, as a powerful antioxidant, it directly protects collagen against damage caused by reactive oxygen species. 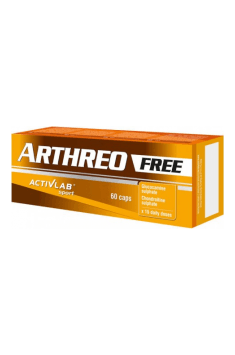 In summary, ACTIVLAB Arthreo-Free is a supplement ideal for people who regularly overload the movement apparatus, whether due to the intense workouts or hard physical work. It can also be recommended to obese people and seniors. The product comprehensively supports the condition of the osteoarticular system and can contribute to the alleviation of dysfunctions within it. bardzo mi pomógł ten suplement z moimi kolanami, efekty juz widziałem po tygodniu! Take 4 capsules a day, preferably 1 capsule per meal. One serving of the supplement includes 4 capsules. It is worth dividing it into a few smaller doses and take them within a few hours, with or without food. The supplement should be taken regularly for minimum 3 months. Do not combine it with paracetamol or statins (cholesterol lowering drugs). If taking these pharmaceuticals, a few hours should be left between the dose of the drug and the dose of the supplement. Anti-caking agent E470b, capsule components: gelatin, dye (E171, E132).